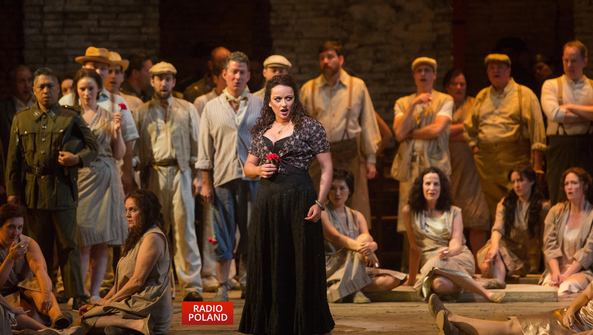 Polish soprano Aleksandra Kurzak sings the part of Micaëla in Bizet's Carmen at the Metropolitan Opera in New York. Saturday's performance is broadcast to over 2, 200 cinemas in more than 70 countries as part of ‘The Met: Live in HD' series. In Poland alone, opera lovers are able to watch the production in 34 venues. The production is a revival of the 2009 premiere, directed by Sir Richard Eyre, with monumental sets by Rob Howell. The title role is sung by Clémentine Margaine, Roberto Alagna is cast as San Jose and Alexander Vinogradov as Escamillo. Louis Langrée is the conductor. Now star tenor Roberto Alagna and his wife, the Polish soprano Aleksandra Kurzak, have made the most poignant duets from Puccini's operas the focus of their first collaborative album, excerpts from Manon Lescaut, La Fanciulla del West, Madama Butterfly, Il tabarro, and of course La bohème – music brimming over with passion and powerful emotions, brilliantly composed for the voice, and subtly orchestrated for the orchestra. The new production features Riccardo Frizza conducting the Sinfonia Varsovia Orchestra.